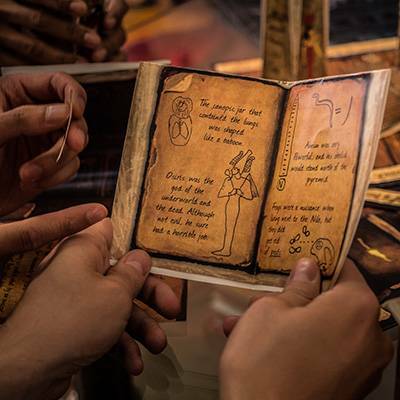 Bethany Mott took our Lost Mummy game and turned it into something so fresh and exciting, it blew us away! In this interview, she takes us step-by-step through how you can do it too. 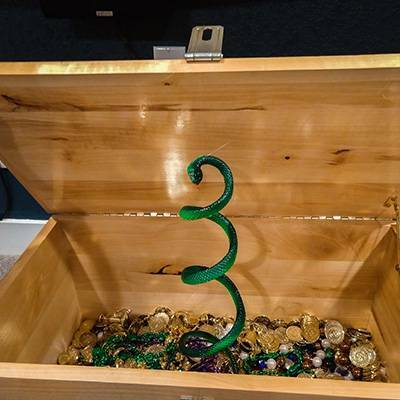 Q1: Who was the escape room party for? The party was for my daughter’s 12th birthday party. There were seven 12-year-old girls total, including my daughter. Because it was a larger group, we divided the girls into two smaller groups (of 3 and 4) and then timed it to see who finished the fastest! This meant we printed game kit out twice. 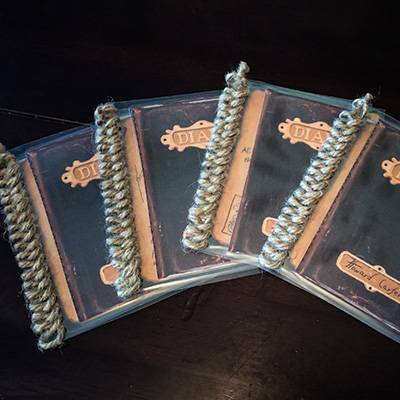 Editors note: if you're after the escape game kit that Beth used you can download it here. Q2: Was putting all that effort in worth it? It was great seeing the happiness and excitement on everyone’s faces! You could see they left the party with their adrenaline still going. It was also fun to spy on the game and see the different personalities of each girl – we used two iPads, with one of them propped up near the ceiling with a clear view of the room and work area, and then had Facetime running so we could watch from another room and give hints if necessary. I also love that we made everything reusable. We now have the whole game neatly stored in a tub and can pull everything out at a moment’s notice. Q3: How did you make the amazing 3D versions of the puzzles? I’m very lucky that my husband does woodworking as a hobby, so we put those skills to use. 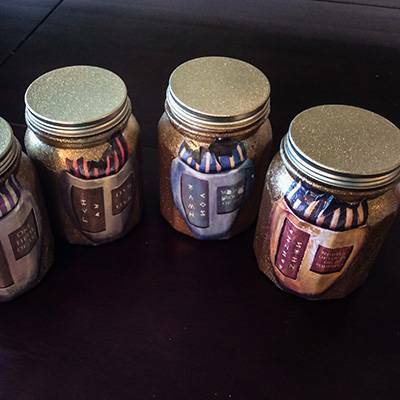 I have very basic crafting skills, so as a team, we were able to accomplish what we wanted. I used a lot of decoupage! I printed these off and cut them out and glued the pages together as the instructions suggest. Then I laminated them and left a deep margin on the spine for binding them. Your local office supply store can both laminate and use their binding machine to punch the binding holes into the side. Inside of a normal spiral binding, I laced some twine through the holes. My husband made this out of wood, and then I used decoupage to attach the paper. 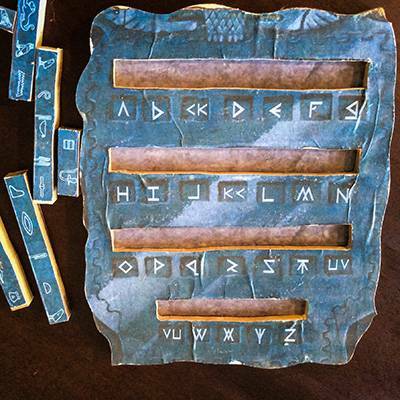 The tablet was actually two 3/8" pieces of wood glued together. He first cut the slots for the symbols out of one piece and then glued that to a solid piece without holes. Then we glued on the printed page and cut the outside with a scroll saw to make it look more like a stone. 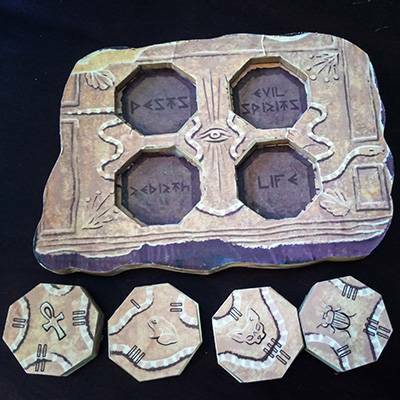 The pieces with symbols were made with thicker wood so they were raised a bit from the surface. 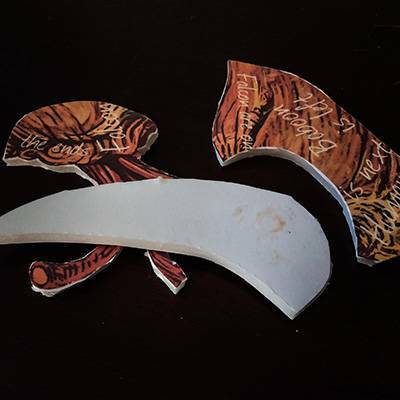 My husband cut it out in wood, again using a scroll saw, and I decoupaged the paper onto it. 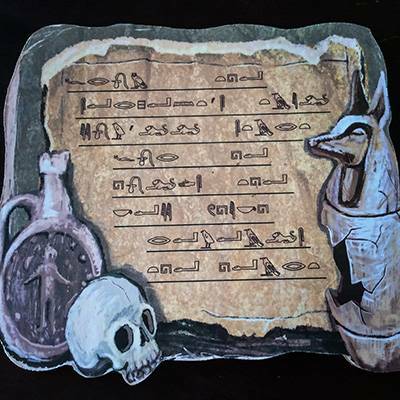 The process was similar to the rosetta stone. The tricky part here was getting all the pieces to fit together enough that the puzzle pieces could fit into any of the 4 locations in any direction. 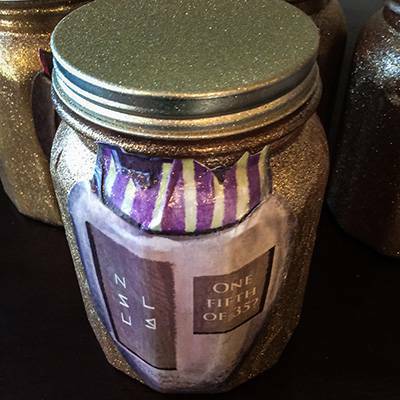 We spray painted the jars and lids with glitter gold paint and painted the inside with dark paint. 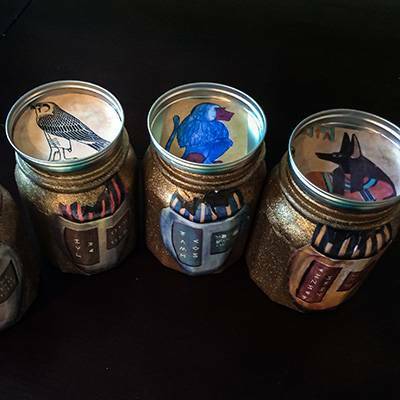 We found egyptian looking pictures of the four animals (baboon, falcon, jackal, human) and decoupaged them to the inside of the lids and also decoupaged the paper jars with the math problems and word scrambles to the outside of the jars. We hid the pieces of the heart puzzle inside the jars. We ended up not using this aspect of the puzzle but our original intention was to use a real feather with the math problem attached or written on it somehow. We made these 3D using foam board, which can be found near the posterboard at any store that sells school supplies. I glued the heart pieces to the board and then used an x-acto knife to cut it out. Then decoupaged over the top. My husband made the shapes out of wood, and then I decoupaged the papers onto them. 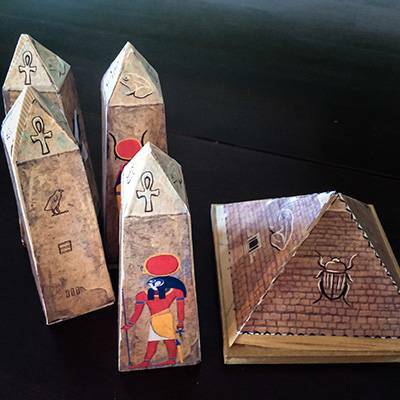 The obelisks were made from 2"x2" wood, cut and sanded to shape using the pattern provided in the kit. The pyramid was made from the provided pattern too, though it took some extra fiddling to get the angles right (because wood has thickness, while paper does not). We made extra obelisks as a distraction. The extra ones we edited so that they didn’t have a god on them. We also edited the correct ones to match the directional combination lock that we wanted to use (up, left, right, down). We installed a new doorknob to the room, with a key so we could lock them in. The final challenge was to access the key so they could use it to get out. Some of our padlocks required that we attach a latch to the door/box/cupboard. We didn’t want to drill holes and make things permanent, so we used Command Hook refill strips to attach the latches. This was a combination of things we had around the house, the Dollar Store, Amazon, and the thrift store. 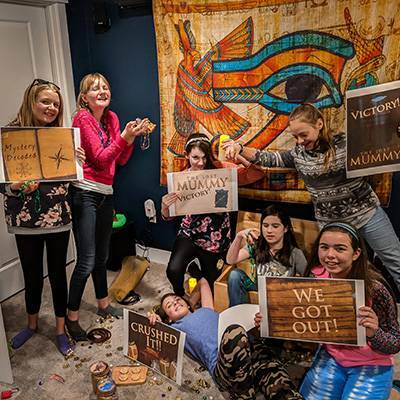 Q4: What did your kids do that made you laugh during the escape room game? It was so funny to see where their minds would go when trying to figure things out! For example, we had a chest sitting in there with a directional lock for the very last challenge. 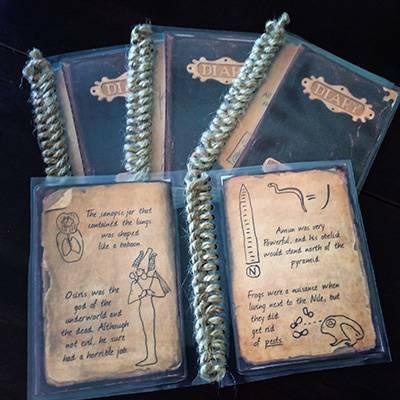 Both teams read in the diaries about “N.E.W.S” and tried that on the lock very first thing – before even attempting the very first challenge. 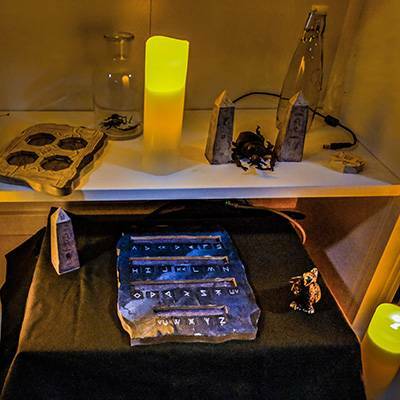 We purposefully set up some distractions (extra obelisks, lids on the wrong jars, etc.) and that definitely threw them off track. 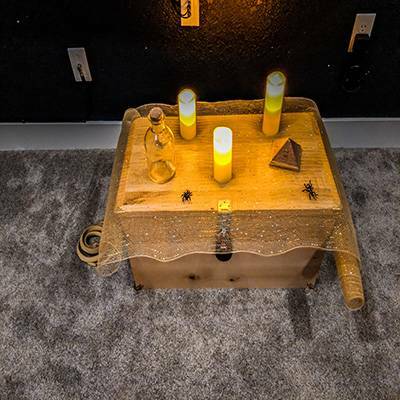 I was also surprised at how they reacted to the clue on the tablet that they deciphered – both teams started collecting the fake snakes in the room instead of looking at the snake path puzzle! Q5: How long did the entire experience take to set up? I would say about 15 hours between my husband and me, over the course of a couple of weeks. 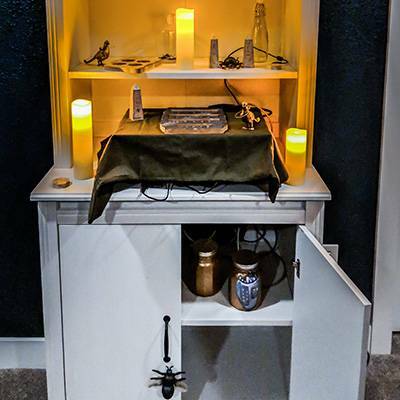 We’ve played professional escape rooms before, so we knew what can make them awesome. The first thing we did was print off the game and just sat at the table and played through it. That instantly showed us what some of the pitfalls might be. Then we talked about what we could do to make it more tactile, like a professional escape room, and made a plan. After that it was just crafting and shopping. I’d prep the girls a little bit better. They were overwhelmed when they walked in and weren’t sure where to start, so I might give them better ideas up-front of what puzzle to start with. We didn’t give them any of the instruction sheets that were in the kit, so some of the narration was lost – I think we’d try to find a way to better incorporate that as part of the initial “orientation” we gave them. It wasn’t a problem for our two adult friends that tested it for us, but it was for the girls. I think we’d also plan for more time. Because none of them had done a “real” escape room before, they didn’t know what to expect. We budgeted about 1 hour per group and they ended up taking about 1:10, even after some coaching. The two adults that did it, finished in about 40 minutes, with only one clue. I think, though, that with more adults it may have slowed them down – and we might add more distractions and hide things better. We loved that the kit was editable! It really made customizing it and exploring some of the various mods possible. 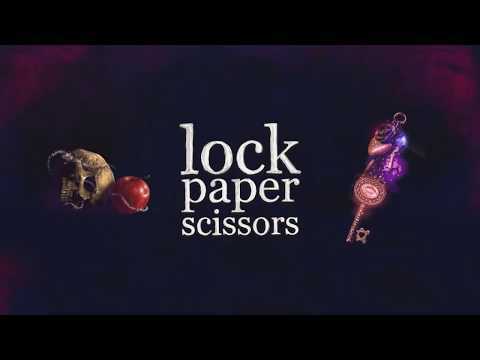 Being able to alter the obelisks, for example, to work with the lock. Also being able to tweak some of the equations and other bits is great! If Bethany’s story inspires you, maybe it’s time to start planning your own epic escape party! 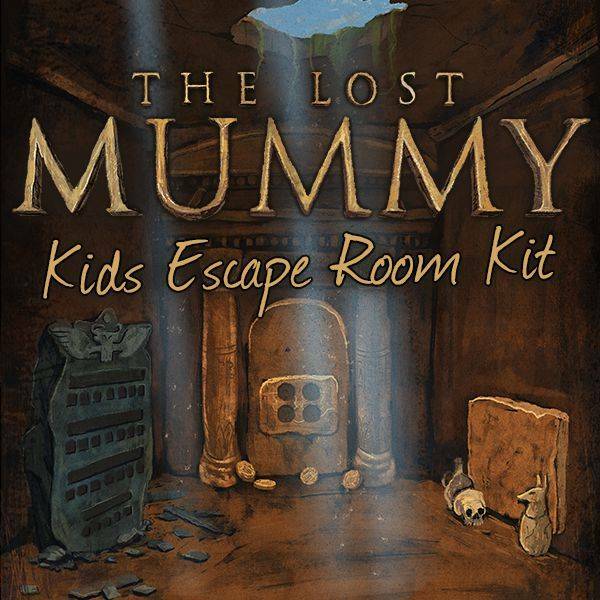 She used The Lost Mummy game kit.